Instructional & Live Concert 'DVDs CDs CDRs from professional players spanning all styles of music. On September 13th 2003, Steve Gadd was honoured by the Zildjian company with the American Drumme..
"Filled with rock-solid information from beginning to end, this intermediate-level DVD helps bas..
"Beginning Funk Bass features Abe Laboriel, one of today's most talented session players and a B.. 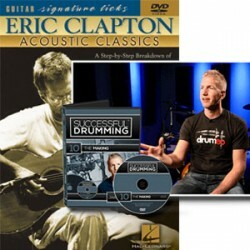 This outstanding DVD teaches the trademark electric guitar riffs and solos behind rock's most in..
"Recorded at the Top of the Plaza in Rochester, New York on February 6, 1973, and..
A totally comprehensive and concise approach for learning how to play the popular African Djembe..
Making the Basics Fun & Easy Series: Instructional/Drum/DVD ..
"FastTrack is a quick way for beginners to learn to play an instrument. These DVDs make the perf.. Description Young Fiddle virtuosos Luke and Jenny Anne Bulla present a highly innovative ..
Instructional DVD for Guitar Series: Instructional/Guitar/DVD ..
"This outstanding DVD is a tribute to Gene Krupa, a certifiable legend of swing who made the dru..
"Getting Started on Electric Guitar offers a complete course for the beginning electric guitaris..
"The nearly four-hour DVD includes Tommy demonstrating the basics of his system, Matched an..